Welcome to the Human Services Learning Center! If you are a Foster Parent do not create your account here, but rather contact your agency to create an account for you. Otherwise you will not be able to register for any Foster Parent classes. If you are not affiliated with an Agency please enter 'none' for Agency, Agency Address and City. Then enter 00000 for Zip. 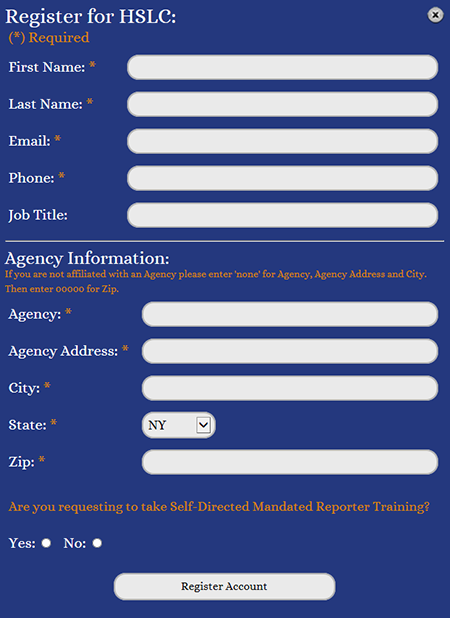 Are you requesting to take Self-Directed Mandated Reporter Training? Easy-to-use Web-based learning management solution for the administration, documentation, tracking, and reporting of training programs, classroom and online events, e-learning programs, and training content. Allow users to search for and reuse small units, or "chunks" of digital learning content and assets commonly referred to as learning objects. The Human Services Learning Center allows users to search an online Course Catalog, register for classes, complete online evaluations, build training plans, and track their continuing education. The registration feature of the training management tool system tracks all your activity and provides a complete training history for its users. Additionally, complete training plans or training paths can be designed and tracked for each user. Organizations in HSLC include state, local districts, and not-for-profit agencies, as well as, day care providers, individuals who are mandated reporters, and foster and adoptive parents. Experience the difference. Learning materials and resources offered for authenticated users (Users with a proper login), or upon completion of a course. You are able to further review the materials or complete them at your own pace, and in whatever manner you desire. Resources are available to be searched, grouped, and saved as a catalog and may not require course registration. The Human Services Learning Center (HSLC) application was edited and designed by The New York State Office of Children and Family Services (OCFS) Bureau of Training and the Office of Temporary and Disability Assistance (OTDA) Bureau of Training and Management Analysis, in conjunction with the City University of New York (CUNY) School of Professional Studies, and the State University and College (SUC) Buffalo Center for Development of Human Services. HSLC Support Specialists are available to provide technical assistance between 8 a.m. and 4 p.m. each weekday. If you need help with the online MANDATED REPORTER - CHILD ABUSE IDENTIFICATION AND REPORTING - CLASS contact the Mandated Reporter (Child Abuse) Training Help Desk * at 1-800-836-0903 OR email MRCustomerService@hslcnys.org. *PLEASE NOTE: This HELP DESK provides assistance for ONLY ONE class, the Mandated Reporter - Child Abuse Identification and Reporting online training. Issues regarding any other trainings should be directed to HSLC Technical Support. See their contact information above. How to register a new account and validate email address? 1.Click "Create Account" which is located below the Login button. 2. Enter your information in the text box for each field: First Name, Last Name, Email, Phone, Job Title, Agency, Agency Address, City, State, and Zip Code. Fields with an orange asterisk* are required. 4. Please Check your Email - you will first receive an email message that will contain instructions for validating your email address. (It may take up to a few hours to receive this email). 5. You will see "Your email address has been successfully validated. You will receive an email shortly with a temporary password for HSLC access." 6. Please Check your Email - You will receive an email message that states "Registration for HSLC was successful. Your Username is your email address. Your Temporary password is xxxxxx. Upon logging in you will be required to create a new password in order to continue." 7. In the email, the words "logging in" are a link. Click on the words logging in. 8. The HSLC Home page will open. 9. 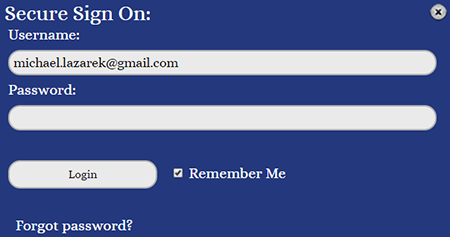 In the Username field, type your username (your email address). 10. In the Password field, type the temporary password you received in the email. 11. The Password Reset Screen will open. What is my HSLC Username and Password? Your HSLC username is your email address. In most cases, this is FirstName.LastName@ocfs.ny.gov. A few staff members may have a username with the old email address, for example: xx1111@dfa.state.ny.us or FirstName.LastName@ocfs.state.ny.us. 3. Type your username (your email address) and click "Reset Password"
4. Please check your email - you will receive an email message that states "A request for password change has been submitted in HSLC. Your reset code is xxxxxxx. Please click here in order to change your password and continue." 5. Click on the word here, which is a link and will open HSLC with a screen to reset your password. 6. Type the password reset code from the email into the Reset Code text box. 7. Type a new password into the New Password text box. 8. Type your new password in the Confirm Password text box. 9. Click Save New Password.